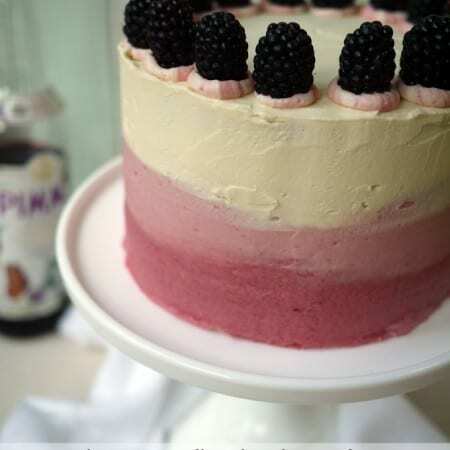 A delicious layer cake recipe for the late summer with a hint of the love Pimms. Stir in 150g of blackberries. Kind of squish them a little with your spoon as you mix so that some break up a bit and the juice of some starts to come out. Stop stirring before it’s quite combined. I like the slightly swirly effect of some of the juice. Reserve 16 blackberries and put the rest with, the Pimms and sugar in a small pan and heat until the sugar is dissolved and the blackberries have broken down. (You may need to press them a bit with your spoon. Strain the syrup through a sieve, making sure you squash out as much juice as possible. Split the icing into 3 bowls. Use a teaspoon at a time of cold syrup to colour one of the bowls of icing deep pink and one light pink. Be careful to not add too much liquid or the icing will split. (If this happens, add a spoonful or 2 of extra icing sugar.) If the white icing is quite stiff, add a little boiling water to soften it. Sandwich each layer together with some of your buttercream (I alternated colours) and a layer white buttercream on top. Then, cover another third up the cake with a good layer of the lighter pink icing. Finally, finish the final third of the outside edge of the cake with the white icing. Now run a clean, smooth scraper or palette knife around the cake, smoothing and slightly blending the 3 icings. Pipe 16 spots of the remaining coloured icing around the top of the cake and pop a blackberry in each one.